For this entry I’ve got a book review for you. This clear and concise book presents a straightforward process for anyone who wants to bring more innovative thinking to their work. My company is called Deliberate Innovation because I’m passionate that acts of ingenuity can be open to all who have access to a great process and this is such a process. Businesses and individuals can benefit by understanding the nature of the journey problem solvers need to take from problem definition through creativity to delivery. 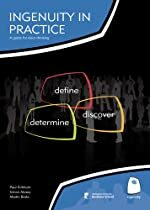 In this book the steps are titled: Define – Discover – Determine, and the fractal way in which these phases are used is simultaneously powerful and accessible. The examples, quotes and stories that populate the book make it a pleasant read for those only casually interested in the subject, but the rigour of the method shows through at all times.